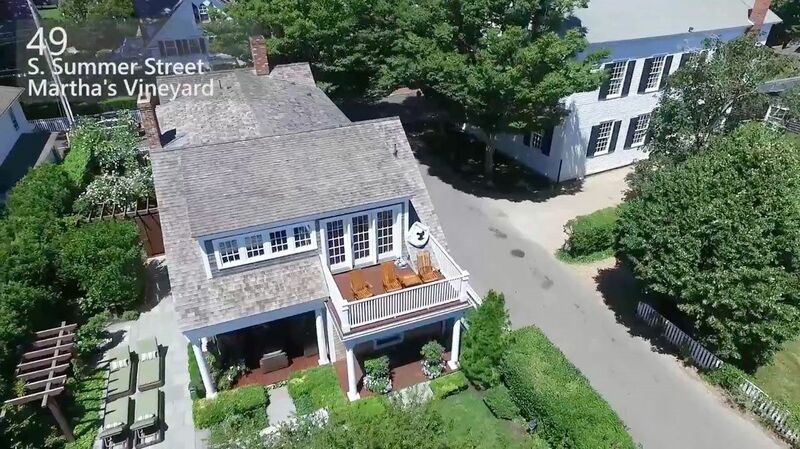 A Master Class in Living the Location- Set in the heart of Edgartown Village just two blocks from Main street and two to the shore of Edgartown Harbor, this beautiful, custom, family compound awaits. Designed by renowned architect Peter Campbell and built in 2007, the classically styled facade of this home welcomes you in to reveal a fresh, chic and sophisticated modern interior. Each detail is thoughtfully and artfully achieved, including exceptionally rare Labradorite blue granite counters, Canadian Maple floors and other luxurious stone, tile and wood custom finishes. Entertain two or twenty with three floors of gracious space, a media room, wet bar for outdoor entertaining and Great room living, dining and kitchen area complete with a wood fireplace for year round warmth. Awake to the fabled sunrises over the Edgartown harbor while sipping your coffee on the second story deck or from inside the comfort of your Chef's kitchen. Stroll the few steps into town to dine, shop or peruse the magnificent art galleries. Ply the waters of Edgartown Harbor in your kayak launched from Collins Beach just a short walk away at the end of Cooke Street. During the warmer months take advantage of the outdoors surrounded by terraces and gardens that effortlessly blend indoor and outdoor living spaces. A garage with an interior reminiscent of the interior of old wooden ships combined with a comfortable Guest Cottage round out the magnificence of this Vineyard delight. This home is the pinnacle of in-town living.